Preparing for a presentation about cloud technologies? Trying to illustrate IT network structure and its devices? These topics can be pretty complicated to explain quickly due to their complexity and level of abstraction. That’s why the good idea is to use symbols to illustrate those informatics concepts. If you’re using bare texts in squares or circles, it is hard for people to follow you. 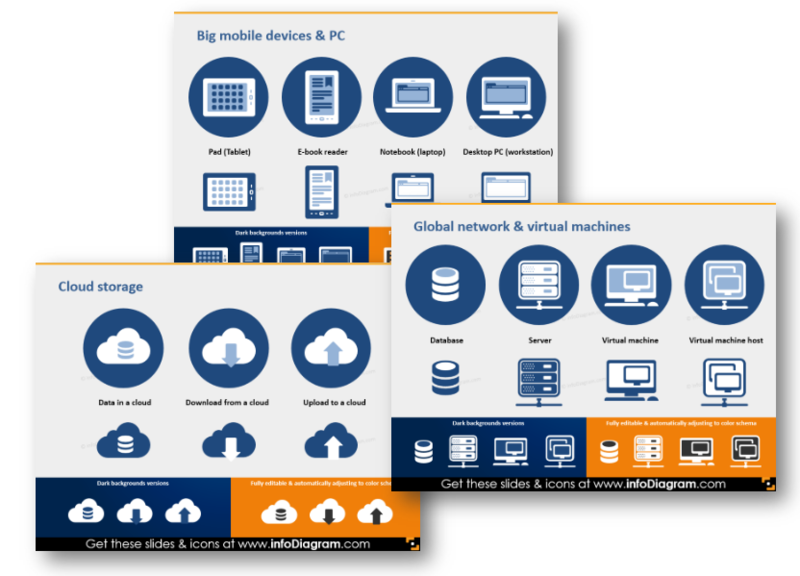 You can get a collection of IT Cloud, Software, Mobile & Network PPT Symbols here. Or click any picture below to see the reusable source graphics. This particular icons collection contains editable symbols for showing various IT concepts: cloud symbols, software and hardware items, mobile and network devices. Check below what you can find there. You can create a brand new look for complex flowcharts about network structure or how cloud technologies work. Having a data classical chart you can quickly enhance it by adding an icon for each category. 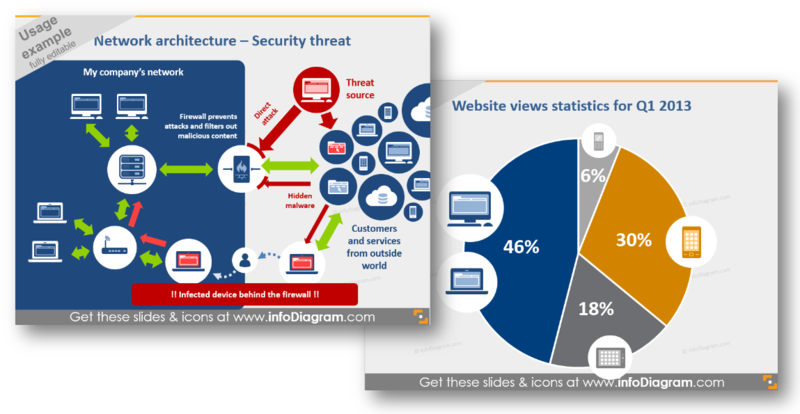 Above you can see diagram schema examples: responsive web design schema PowerPoint diagram, website views statistics chart, network architecture security threat diagram and cloud-based device data synchronization diagram. Besides adding the icons to PowerPoint slide, you can use them also in other documents – eBooks, Excel sheets, also Keynote, Prezi and other tools. For MS Office apps a simple copy & paste of the data chart or symbols will work. For other tools (Canva, Prezi..) saving icons as an image and adding them as a picture will do the work too. What’s inside Cloud, Software, Mobile & Network devices set? The set contains over modern, flat symbols which are all presented as editable vector artwork. The icons and charts are completely customizable. You can change colors to your brand ones, the color scheme and layout of your presentation. All icons are in simple flat style, suitable for Metro UI style graphics. There are four color versions: for a light background, dark background, stand-alone, in a circle. If you need more graphics of this kind, get the bigger IT Icons Bundle, which contains a wider collection of icons for presenting various IT concepts.